Becoming More Green And… Shiny? We recently had an Energy Specialist come into our house for an evaluation of how efficient our house is and what we can do, if anything, to improve upon it. The man, let’s call him Tom (mostly because it is his name), spent about two hours on the evaluation. He started in the basement and worked his way up to the attic, checking for specific things and using a thermal imagery video camera to highlight “areas of opportunity” (that’s a phrase I learned back at MCI in the late 90’s; it means “problem”, but sounds nicer on a performance review). The analysis report took a few weeks to turn around. When it was finally ready, Tom provided us with an 18 page document, replete with color photos and descriptive text of problem resolution. It started by indicating the overall efficiency of our house. We have an air leakage rate of 0.19 air changes per hour (the ideal rate is 0.35), which is like the equivalent of having a 10” x 10” opening in the side of our house, 24 hours a day (but one the cats can’t get through). He said that was pretty darn good, considering some people have air leakage rates that are equivalent to a 10’ x 10’ opening (!!!). I was not completely surprised by these results. The existing efficiency of our house was one of its main selling points for us. Still, it is nice to hear it from a professional. The document also showed us the primary areas of heat/cold exchange and indicated how we could make improvements to increase efficiency. Interestingly enough, he cautioned us about making the house too efficient, which would require us to figure out ways of occasionally exchanging the air in the house with fresh air. … and the fireplace chimney. One interesting item was an HVAC return that was pulling hot/cold/dirty air in from the attic space where the return connected to the top plate of the wall. Most of these leaks were easily addressed with some manual labor, a good amount of silicone caulk, and expanding spray foam insulation. 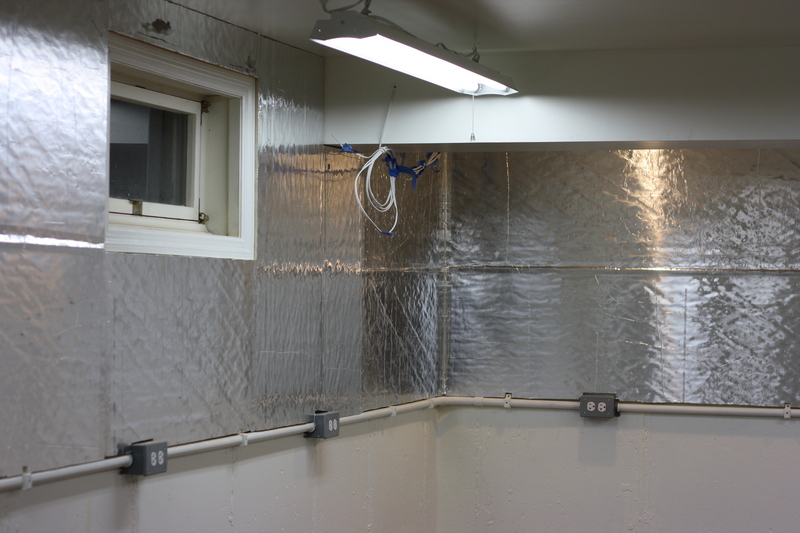 We also replaced two of our bathroom vents (which were so old they were venting absolutely zero air) and insulated the duct work for the vents to prevent condensation in the attic space. We replaced wooden floor registers with metal ones that did not restrict the air flow and added little directional caps to some of the floor vents to prevent them from just blowing air up into the curtains. One of the Secondary Priority Items Tom recommended doing (which would also make my workshop in the basement more comfortable, thus bumping it up to a Primary Priority Item) was to insulate the top half of the basement walls that were above the frost line with Dow Thermax insulation panels. I went ahead and had him do this, along with some of the items that involved work in the attic. He was finally able to stop by this last weekend and get that insulation added. I was out of town with Finley, so I didn’t get to see the finished work until later that night. But… I guess I didn’t really think about what that might look like when it was done. Add some UV lights to my ceiling and tan while I work. Purchase two dozen rolls of plaid contact paper and make this place a swanky 1970’s BBC sitcom workpad. Pick up a set of the Millers Falls Buck Rogers-style tools and start wearing rope lights while I work. Start taking up donations of scrap PSA veneer and slowly create a Studley Workshop. What do you think? Anyone out there have any ideas? Good or bad. ← Handworks is almost here! Ummm… No? I think that’s true. A cold nose means they’re healthy, right? Look forward to your solution as I’m using similar panels in my garage. I saw the another woodworker in a kilt in amana, but didn’t see you! Yeah… I was going to wear it on Saturday, but it was too damn cold! So I decided to go by the moniker, “The Warm Woodworker” and throw on some jeans. It does have a Buck Rogers feel to it, and you can get LEDs on a string from Lee Valley now…. I can just imagine the pipeline of “MF” jokes we’d get as you acquired your new kit! I’m looking forward to your Hand Works write-up. It was a tough call to skip Amana, but I was knee-deep in oak shavings and loving it. Maybe next year. Glad someone else remembers the dancing rope light things from that show. I don’t think I can do it. I just don’t find one thing appealing about that whole era of tools from MF. So maybe that idea isn’t going to happen. Sorry to hear you couldn’t make Amana! There was lots of good and just a little bad about it. I spent some money, too, but it was on stuff I’d planned on buying for several months now and just figured I’d buy it all there and avoid any shipping charges. Then, after watching Don Williams do some finishing techniques with wax, I picked up another tool of which I should probably laud the acquisition price. 😉 More on that later, as well. I had a similar basement problem that I solved with white prefinished pegboard. The three quarter inch standoff behind the board preserved the radiant barrier effect of the foil. Anything applied directly to the foil will destroy that effect and lower the R-value. Now the walls are white and offer storage! Thanks for the suggestion and the information, Scott! I hate to have to frame out the two walls after I’ve already done so much framing and finishing… I think I’m going to let it go for a bit and see what I think in a few months. In the mean time, I’ll French Cleat the other two walls and start working on wall storage and see where that leaves me. Please, can you tell us about the “SUDLEY TOOL CHEST” conference you attended to? I wanted to see that so bad and nobody is blogging about it.